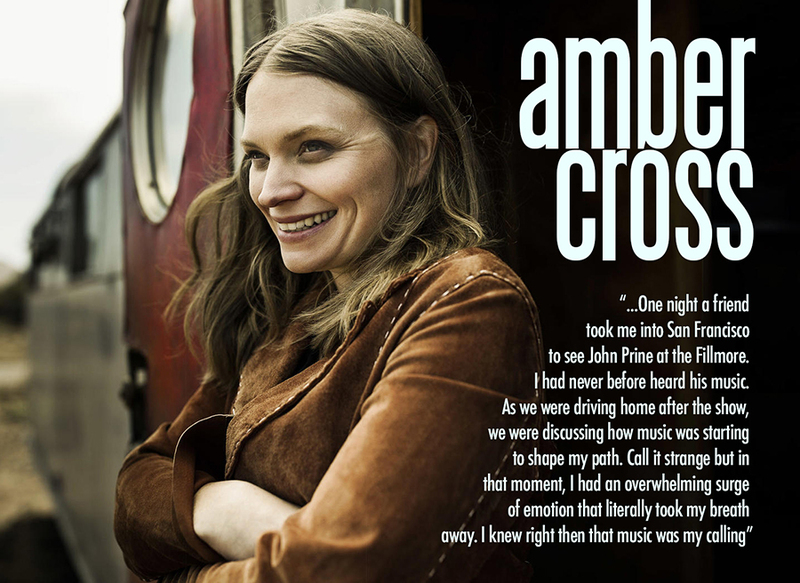 There is an undisputed authenticity to the music of Amber Cross. Her style has developed instinctively from a young child singing gospel at church in small town Maine, through the liberation of her college years and eventually leading to the release of three albums. The word unique is often bandied about carelessly describing certain artists, but it hits the nail bang on centre when characterising her. If her most recent album Savage On The Downhill has passed you by, take my advice and search out a copy. Lonesome Highway spoke with Amber about the album and more, in advance of her tour dates in Ireland and the U.K. over the coming weeks. I understand that you were born and raised in a rural town in Maine and that your father was a local pastor. Were hymns and gospel your first musical exposures and at what stage did you embrace music outside these confines? The first 14 or so years of my life were spent almost solely listening to the music that was sung in our church, directly from a Baptist hymnal. I had little peeks into secular music every now and then. I was given a radio for my birthday when I was about 5 or 6 years old, but I was not permitted to turn the dial off 88.5, the Christian radio station. I used to hide under the covers in my bedroom and I clearly remember fearfully turning that little black knob and hearing my first country song Swinging by John Anderson. It stopped me flat. My mom also had an Anne Murray greatest hits cassette tape that she would play, and that album remains one of my favourites. Once in high school, I started to listen to what I wanted. Access was limited though as there wasn't a music store for a hundred miles. I heard Tom Waits around that time and got deep into his work, where I would remain. When I was nineteen, I moved to New Mexico to go to college and wandered into a contra dance with a live string band. I'd never seen anything like it. Dancing was always forbidden and I'd never seen a fiddle before. The next week I went down to a pawn shop and bought one. I called home and had a lady in our church mail me a hymn book. I could not read music but those were the songs I knew so well. I soon found myself skipping classes and just sitting home picking out hymns on the fiddle. Friends I made through music were very generous with their time and I eagerly picked up the old-time tunes they taught me. Then I was handed two albums; the soundtrack to the movie Songcatcher and Tim O'Brien's Songs From The Mountain. Both those records changed my life. It was the music that made me feel whole. I heard Iris DeMent sing for the first time and took to learning a slew of ballads. She's been a big inspiration to me. Within months I dropped out of college and started traveling around, contra dancing and playing fiddle. I was completely obsessed, living out of my car, working here and there, always, always, chasing the music. Then I found myself in California in a song circle one night with a bunch of folk musicians. I was getting frustrated trying to sing with my fiddle. Someone handed me a guitar and showed me a few chords. I rarely pick up the fiddle now. It's just what lead me to my voice. Did your introductions to other music categories turn you against the music of your childhood in any way? I would say, no. Though it surprises me that it didn’t in some way. Those old hymns are part of me and I never blamed them for anything, like I once did with other aspects of the church. I would say that my exposure to the greater world turned me against the church for a while. It took me some time to understand and accept why I had been so sheltered. You moved from Maine to study in New Mexico, which must have seemed like relocating to another world entirely. Was the change of address a particular culture shock both musically and environmentally? It was a complete culture shock. I remember sitting in my first lecture hall at NMSU and recognizing that there were more people in that room than in the town I grew up in. A big one was the introduction to the local food. I had never seen an avocado before. I had no idea what an enchilada was. My first job was cooking at a day-care and one afternoon I was given the ingredients to make enchiladas. There was no one to answer my questions on how to make them so I just made something that looked like lasagne and the kids wouldn't touch it. Because I was so open to influence at that time, I would say the landscape has had a lasting effect on my writing. I fell in love with the deserts of the southwest. I always thought I would be back living there by now, but that just hasn’t been in the cards for me. At what stage did you decide to pursue a career in music and what were the factors that led you down that path? When I was living in the Bay Area of California, I had been pursuing music for some time but had not given myself fully to it. Then one night a friend took me into San Francisco to see John Prine at the Fillmore. I had never before heard his music. As we were driving home after the show, we were discussing how music was starting to shape my path. Call it strange but in that moment, I had an overwhelming surge of emotion that literally took my breath away. I knew right then that music was my calling. Your vocal has been correctly described as sounding as if it had been plucked from an archival Smithsonian field recording. Is this a progression from your natural accent and articulation as a child or did you study formally as a vocalist? My voice has developed naturally. I have never taken vocal lessons. When I first started singing in public, I was approached by numerous people advising me never to take lessons. I had no desire to study vocals and I am glad I took their advice. My vocal style came about from the music I was listening to and also just singing in a way that physically felt good, from deep in my chest. I don’t give it much thought at all. Even with the financial pickings so meagre in the music industry these days, many artists speak of ‘needing’ rather than ‘wanting’ to continue writing and performing, the process being therapeutic and calming. Has this been your experience? I have found that if I ever feel out of balance in my life then I need to ask myself how much time I am giving to writing and playing music. I always find that I am not spending enough time in the process, and that if I give more energy to it I will in turn feel more balanced. Combining your devotion to the outdoor life while composing and singing seems like a throwback to yesteryear and a particularly refreshing coalescence at that. Are they two separate loves for you or do they overlap? As writing puts me in balance so does being in nature. Being outdoors clears my mind so the songs can come easily. I feel more at home in nature than anywhere else. I spent a couple years living in northern California in a remote area. I spent far more time outside than I ever did inside. I did a lot of writing at that time and very little performing. The songs I wrote there are the ones that centre me most when I sing them. So, I’d say, yes, the two definitely overlap. You’ve written previously of your attendance at the National Cowboy Poetry convention in Elko, Nevada and the immediate impact that the performance and music of Chuck Hawthorne made on you. What changes in direction both vocally and musically did the experience have? I went to Elko to kind of get myself out there and see if I might find somehow find a producer. I was led through Chuck to Ray Bonneville, which landed me smack dab in Americana. On an off chance I met Gurf a month or so later and really liked him. I had no idea that he and Ray were such good friends. All these folks influenced the sound of the record. Vocally nothing really changed. Ray just took my voice as it was, pulled the songs he was most drawn to, and wrapped them rather simply in a way we both liked. However, I’d say one thing Ray encouraged me to do was sing a few of the songs a half step above where I would normally sing them. The slight push in the vocals - specifically I am thinking about Tracey Joe - added variation in the set. I pay attention to that now and try to recognize when I should push out of my comfort zone vocally. The encounter resulted in Ray Bonneville producing your current album Savage On The Downhill. What did Ray’s production bring to the album given that it was your third record? Ray’s song selection impacted this album quite a bit. Ray is drawn to darker, more serious song material. I played twenty five or so songs for him when we began working together. He could have picked an entirely different set of songs and made a very different album. I’ve always been curious what that album might have sounded like. Were all the songs written prior to hooking up with Bonneville or had they been a work in progress? All the songs were written prior to meeting Ray but there were two songs - Tracey Joe and Savage - that we reworked together. I originally brought Tracy Joe to Ray looking for guidance. I had a strong melody and story but had way too many verses. I was so attached to the story that I couldn’t trim it down in a way I was satisfied. Ray helped to re-write parts of the song so that it was sung from the mother’s perspective and that helped solidify the song. I wrote a song called Cattle Trails that was selected to be recorded on this album. As we went deeper into the album project, Ray felt more and more like the song needed to be re-written. It took me a long time to come around to accepting the idea, but he was right. We wrote from two perspectives. We used imagery I brought forward from years I had spent encountering an elusive, wild boar. The animal had become legendary in my mind. He could never be captured. I had many close encounters with him and felt my heart in my throat on more than one occasion. But I could never pull the trigger as I was so awestruck by his beauty and size. We drew from the intensity of those encounters and paralleled the imagery with being trapped in an abusive relationship. The baggage you carry from a bad relationship can stalk you like a demon. The song is about finding your way out by turning the tables to victim stalking predator. How different was the writing and recording process by comparison with your previous albums, You Can Come In (2013) and My Kind Of Church (2014)? In producing my first album I wanted to pay homage to the music and personal influences that had brought songwriting out of me. You Can Come Inwas an expression of the sound and community I was immersed in as an early songwriter. My Kind of Church was recorded spontaneously at a festival. I actually had no idea that it was being recorded and that made it all the better, I think. Gospel music is dear to my heart and I had had the desire to record a gospel album for some time. We were pleasantly surprised when we heard the tracks so decided, why not? It captured the community feel we all value so much. What I wanted with the third album was a sound that felt more like me. I love the old-time sound but these songs seemed to ask for another flavour. I had no idea how to give them that but knew that in working with the right producer, that sound would be discovered. I was at a point in my writing that I was less protective of my songs and more open to constructive criticism. Ray challenged me in ways that allowed me to grow and that was exactly what I was looking for. I believe you did not have the opportunity to tour Savage On The Downhill when it was released in 2017? No, unfortunately I did not tour beyond my home state. I returned from Austin, signed off on the final mixes and a week later found out I was pregnant. After talking to Ray, we decided it was best to delay the release of the album until the baby was born. I had this fantasy of being able to tour with an infant but that was a total illusion. The exhaustion was unreal. But I guess nothing could have prepared me more for this upcoming tour! Your about to play a number of dates in Ireland and the U.K. Have you played over here previously and what are your expectations for the tour? I have never travelled to Ireland or the U.K. before. Honestly, I am trying not to think about it too much because it is so exciting to be able to be doing this. It’s a dream I have held for quite some time and now it is only weeks away.